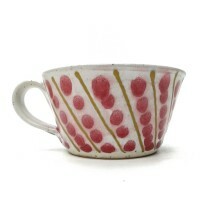 Cup with stripe and dot glaze decoration. 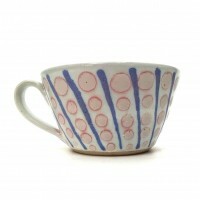 A hand thrown cup with blue and pink trailed glaze decoration. A good cup for breakfast coffee or hot chocolate. Equally good with tea though, which is what mine gets poured into it every day - and still going strong. Size:3" height x 5" diameter. Materials: Stoneware Clay and Food Safe Glazes. This pot is repeatable in different colours - Please enquire. 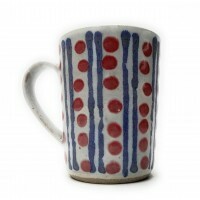 Mug with stripe and dot glaze decoration.A unique mug with bright trailed glaze decoration. 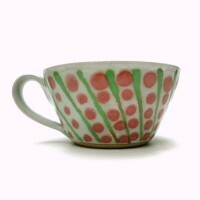 Dotty.Size: 4" height x 3" diameter.Care: Microwave & Dishwasher safe.Materials: Stoneware Clay and Food Safe..
Cup with stripe and dot glaze decoration.A hand thrown cup with green and red trailed glaze decoration. Excellent for morning coffee or hot chocolate anytime. 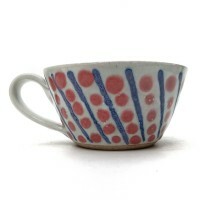 Dot and stripe pattern.Size:3" height x 5" dia..
Cup with stripe and dot glaze decoration.A unique cup with blue and pink trailed glaze decoration. Dotty.Size:3" height x 5" diameter.Care: Microwave/Dishwasher safe.Materials: Stoneware Clay and Food..
Cup with stripe and dot glaze decoration.A unique cup with blue and pink trailed glaze decoration. Ideal for morning coffee or hot chocolate at any time. 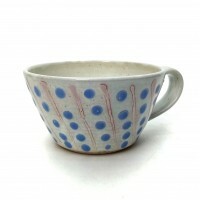 Dotty.Size:3" height x 5" diameter.Care: Micro..
Cup with stripe and dot glaze decoration.A unique cup with blue and red trailed glaze decoration. 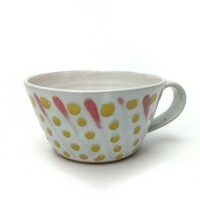 Dots and stripes.Size:3" height x 5" diameter.Care: Microwave/Dishwasher safe.Materials: Stoneware Cla..
Cup with stripe and dot glaze decoration.A unique cup with yellow and red trailed glaze decoration. 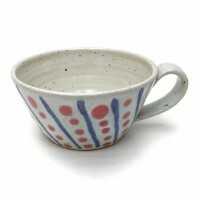 Dots and stripes.Size:3" height x 5" diameter.Care: Microwave/Dishwasher safe.Materials: Stoneware C..